So, since getting to Australia, not everything has gone entirely according to plan. Or, perhaps they were seeing as how I really didn’t have a “plan”. What I had was a pretty vague list of things to do, places to be, people to contact, etc. All in all, things hadn’t become catastrophic, but I felt as though I wasn’t doing anything productive with my time. I was finding it very difficult to get any work, especially without the necessary credentials. And without work, my monetary reserves were drying up, I needed to figure things out. I’ve been afforded the luxury of being able to stay at a friends apartment here rent free, which has been a real blessing, however, I still needed to eat and food supplies and eating out is quite expensive in Port Douglas. Enter the wwoof. Wwoof is an acronym, willing workers on organic farms, and I believe that it is a program that exists around the world. What the program does is it puts you in contact with farms throughout the region/country in which you put in a few hours of work in exchange for accommodation and meals. Its a pretty cool idea. The only thing is you don’t earn an income, but on a positive note, you don’t spend any money either. 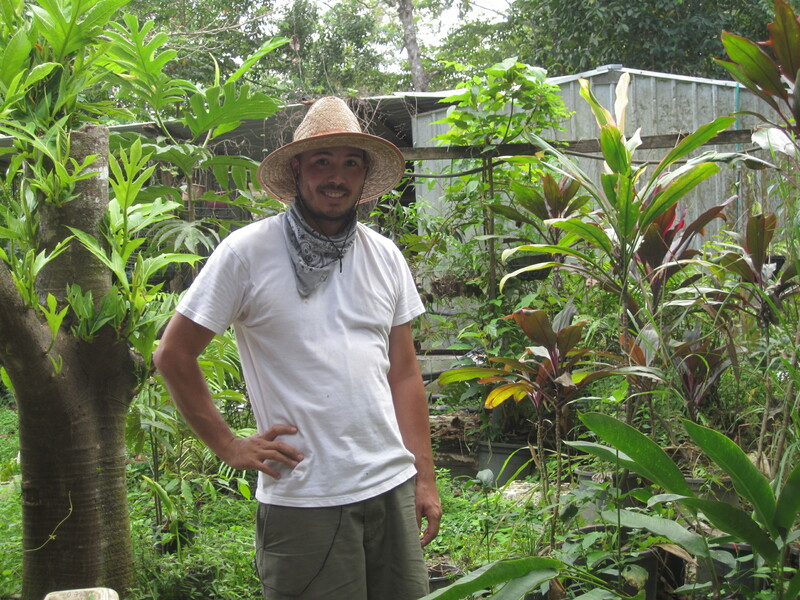 I arranged my first wwoofing experience with a nearby tropical fruit winery. Tony and Trudie were the owners and my hosts for the next ten days. Their property was set at the foothills of the Great Dividing Range just outside of Mossman. They have several acres in which they grow and harvest several varieties of rare tropical fruits including jaboticaba, lychee, black sapote, soursop, purple star apples, pineapple, bananas, carambola. What started as a hobby, turned into a business for the couple. They had more fruit than they could eat or give away, so they began wine-making. Seemed pretty logical. They have a decent sized winery on the farm where the wines are produced. Trudie is the main and only wine maker, and they are open to the public seven days a week offering tours of the farm and tastings of their wines. My duties on the farm included picking fruit, upkeep of the property, planting and transplanting plants, vegetable picking from the garden, walking the dogs, labeling wine bottles, assisting in the winery. I worked everyday from 8am until about 1.30pm, and sometimes helping out in the evenings in the winery. This left me with a substantial amount of free time. I made the most of it, taking a bike ride almost everyday, reading, napping, and running. One thing that I enjoyed initially was the solitude, but I grew bored after about the third day. There was nobody to talk to, I had really limited internet access, no phone reception, so I terminated my stay a couple days early in order to reacquaint myself with civilization. While on the farm, I stayed in a dilapidated and soggy caravan. 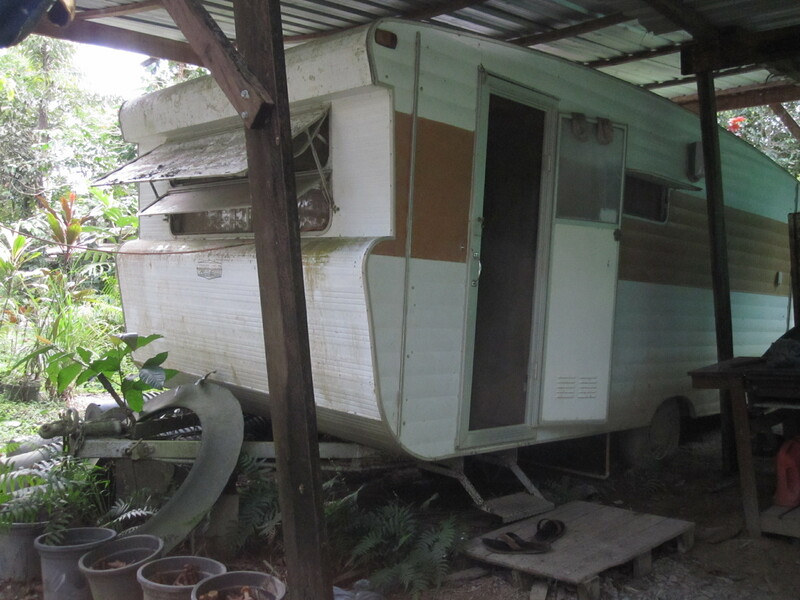 It had no running water, but it had a fridge, an oscillating fan, and an air conditioning unit. It also had mold, was ridden with holes for creatures to enter, and an unpleasant odor. I made do. The experience on the whole was enriching, educational, and for the most part pretty enjoyable. Tony and Trudie were great hosts and I look forward to meeting more people outside of the tourist trap that is Port Douglas. Australia is a mighty big country, and I’m eager to explore its offerings. This entry was posted in Uncategorized and tagged Australia, Food, Fruit, Organic farming, Port Douglas, Recreation, Tourism, tropical, Wine, Winemaking, winery, wwoof. Bookmark the permalink.